There was this ice cream truck, no doubt drawn by the crowd of seemingly undernourished folks in the middle of Baltimore’s Druid Hill Park, who spent most of the day course-side at Charm City Cyclocross. It’s a free country, and I’m not one to turn away from a good ice cream sandwich or drumstick, but the music, oh, the music. It was an eight hour barrage of “If Your Ears Hang Low,” on a loop. I don’t want to think what the guy in the truck did to cope with that inside his skull all day, every day. So for him, and all of you who parked near that truck, this video is dedicated to you. As for the racing? It was phenomenal. Sunday in Charm City was the perfect autumn day. Moderate temperatures, sunny skies and a kickin’ cross course. The big guns put on another great show and the seventh year of racing in Druid Hill Park goes down as one of the best. 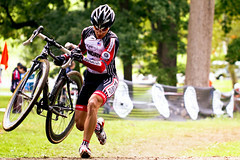 Next week is Tacchino Cyclocross in Upper Marlboro, Md. If you are there, come say hi. I’ll be the guy with the microphone. Until then, here are more sights and sounds from Sunday’s race. oh my god, that Mr Softee truck was driving me C R A Z Y ! It wasn’t even the real song too, it was some fake version that just made slightly more annoying. wow – that 2nd song brough back some memories, but not enough to remember the band name. i had a floppy ep that was shipped straight from the band from england YEARS ago if i’m remembering it right. i gotta see if i can find that worn out thing… Thanks! Thanks! The floppy ep I was thinking of was Ripcord. Not sure why I confused them w Subhumans. Thanks for the great videos! HEHAAAAAAA I SEEIGNK SOEM UGLYYY TAEM MONEEYS N STUFFT SKINNSIUTS!!!!!!!!!!!!!!!!! !